There is certainly a big pool of choices for agencies to choose from when it comes to picking a website audit tool. There are standalone tools and those that come as part of a package. Some audit tools go through all pages of a website while others just give an overview of a specific page. And there are some tools that claim to be developed specifically for agencies but in reality can’t cope with the requirements that are very important to digital agencies and digital commerce services. In this article, we are going to dive deep into what exactly agencies need when it comes to website audits and what to look for when choosing the tool for this task. Select a website audit tool that is powerful enough to scan as deeply as possible (scan all pages, subdomains, and even test pages), and with a high level of detailing so that you can see what pages require your immediate attention and which ones can wait for a little. My favorite website audit tool in terms of control and completeness is that of SE Ranking. These guys really went the extra mile in creating a tool that lets users set the scanning depth and speed. You can decide what pages to audit (you can upload URLs in an excel file, configure whether the scanning process should follow or ignore robots.txt rules, or set up your own rules). Plus you can choose the maximum number of pages to audit and define what should be treated as an error at the main negotiable optimization points. I also like the fact that all their reports are white-labeled and highly customizable. On top of that, I love that the functionality of their website audit includes the option to create an XML sitemap right there in the tool and in just a few clicks. SEO as part of marketing sure is a way to drive and convert traffic. In that perspective, a website audit helps to discover errors and fix problems that prevent website pages from being ranked higher in SERPs. In other words, you are using a website audit to make your website make more money. But for those that make a living out of digital marketing, a website audit is also a tool that generates income by itself so to speak. For example, SE Ranking offers a tool called lead generator which is a web form installed on your site that provides a free on-page audit to anyone that fills out the form (I also like the one from MySite Auditor). The audit report comes in a nice, easy-to-read format that anyone can understand. Such widgets bring value to your visitors and build trust in your services. And for you qualified leads and a list of problems their pages have which is a great starting point for a nurturing conversation. How well and easily can you customize the widget itself and the report it generates? Does it come as part of a subscription plan, and what package? Do you control the number of reports the widget can generate? What exactly does the tool audit? Does it integrate directly with your CRM and how easily? Ideally, the lead generating option has to be easily customizable and be able to integrate with your CRM, that way you can incorporate it nicely into your site and your business operations. SEO Softwares that offer a lead generation form: WooRank, SE Ranking, MySite Auditor. Presenting your SEO services based on data collected by your own technology is an incredibly powerful way to create brand ambassadors for your agency. You can use a software that offers a white labeled website audit and customizable reporting only but I found those to come with a lot of limitations. For an agency, a full white label option is the best choice regardless of whether you want to do a website audit or present an array of your digital services in a way that reflects your identity in the most complete manner. Building credibility and trust with your clients is the number one priority for agencies. As found in multiple sources, over about 70% percent of a business that comes to agencies is generated through referral which is built on trust and loyalty. Choose the one that offers white label as part of a subscription plan. The software has to be easily customizable. The reports need to reflect your identity, be easily created and distributed. The projects should be accessible through links with no additional authorization but with full authorization control for different levels of access. Another valuable tip: Use your own domain/subdomain for white label SEO. That way the services you are providing will look authentic and genuine with no traces back to the parent software. SEO Softwares where white label comes with the subscription: SE Ranking, WebCEO, BrightLocal, NinjaCat. More software are listed here. I don’t know about you but the majority of my clients are expecting results the next day after signing the retainer for my services. Their web pages should be at the top of the SERPs right away which, of course, is not possible. So what else can agencies do to justify their bread and butter for a good number of months before their efforts start yielding tangible results? I show dynamics. Website Audit is a great tool for showing progress especially if the tool you choose provides comparison data and analytics over time. I like to show clients the initial report with all sorts of errors in there and then provide the cut from a different period of time in the month from the first reporting, two months, and so forth. Look how many errors we fixed, I tell my clients, how many things are optimized, and how many improvements we’ve implemented. SEO softwares that offer a comparison audit: MySiteAuditor, SEMRush, ScreamingFrog, SEO Report Card. I can’t stress enough how important it is for agencies to be able to slice and dice data they are working with for a client in a visually appealing and informative format. I would say that reporting is a tool for keeping clients happy while having a close eye on the ROI of your SEO progress and investments. Reports should be available as an on-demand created a manual report or an automatically generated report delivered on set schedule to specific email addresses. Reports must be white-labeled and highly customizable in order to present them in the most authentic manner that reflects your brand and expertise. 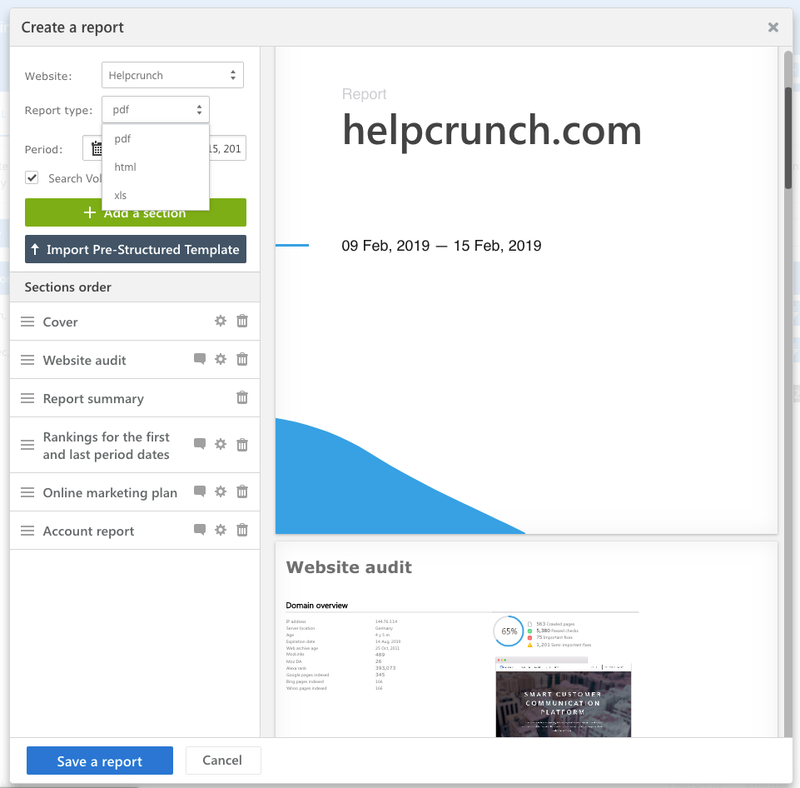 Make sure website audit reporting offers easy to use customization options, like the ability to choose a time period; drag and drop modules; notes and comments options. Reports must be ready-to-download in popular formats such as .pdf, .csv, .xls or .html. You should be able to email the reports and/or give access to the reports stored in the cloud. SEO software that offer robust reporting within the website audit: SE Ranking, MySiteAuditor, SEMRush, Ahrefs. I know some people say that agencies or marketing teams like to use website auditing software that do just that, run a website audit. But in my years of experience, I found it to be highly inefficient since there are so many tasks to do for a client, so many projects to handle. This contributes to the juggling between the interfaces, reports, and functionality that gets really annoying if not completely chaotic. What I do is, use the SEO platform that comes with everything and has a very powerful website audit module that complies with all the requirements I outlined above. It saves me time and money. And I do use the one that comes with a white label, so everything I present to my clients is deeply branded and rooted into my business values. Diana Ford is a digital marketing specialist with writing expertise that spans across online marketing, SEO, social media and blogging. She can be found on Twitter @diana_ford. The post How to pick the best website audit tool for your digital agency appeared first on Search Engine Watch.